The woman who has accused Supreme Court Justice nominee Brett Kavanaugh of sexual misconduct, Christine Blasey Ford, is calling for an FBI investigation before testifying in front of the Senate Judiciary Committee. And Ford's lawyers admonished the committee for scheduling the hearing so soon after her allegations became public. "While Dr. Ford's life was being turned upside down, you and your staff scheduled a public hearing for her to testify at the same table as Judge Kavanaugh in front of two dozen U.S. senators on national television to relive this traumatic and harrowing incident," said a letter Tuesday evening from Ford's lawyers to Sen. Charles Grassley, the committee chairman. The committee invited both Kavanaugh and Ford to testify on the allegations, and Kavanaugh accepted. Mark Judge, who allegedly was also at the party in question in the 1980s, and in the room with Kavanaugh, said through his attorney he has no memory of the alleged incident and does not wish to testify publicly. Democrats are accusing Grassley of trying to rush through the confirmation. They say that two witnesses are insufficient, and the rushed nature could lead to the "mistakes" of the Anita Hill hearings during Clarence Thomas' Supreme Court confirmation hearings. The hearing scheduled for Monday represents a significant change in Kavanaugh's confirmation process. The committee had planned a meeting Thursday, but postponed it to allow for Kavanaugh and Ford to testify. Even if Ford does not appear Monday, Republicans could continue to give Kavanaugh the opportunity address the allegations. The letter on Tuesday said that Ford "wants to cooperate with the Committee and with law enforcement." The lawyers said an FBI investigation should come first. "A full investigation by law enforcement officials will ensure that the crucial facts and witnesses in this matter are assessed in a non-partisan manner, and that the Committee is fully informed before conducting any hearing or making any decisions." The lawyers said that Ford has been the target of "vicious harassment and even death threats" and that her family has relocated. Grassley responded to the letter later Tuesday evening: "Dr. Ford's testimony would reflect her personal knowledge and memory of events. Nothing the FBI or any other investigator does would have any bearing on what Dr. Ford tells the committee, so there is no reason for any further delay." Democrats -- and now Ford -- are urging the FBI to reopen the investigation into Kavanaugh's history, which was essentially a background check. According to CBS News contributor Ron Hosko, who is a former assistant director of the FBI, the FBI could investigate if evidence arose of a federal crime or of a national security matter while investigators were conducting Kavanaugh's background check. (For instance, if a federal crime had been committed 35 years ago and beyond the statute of limitations, the bureau might opt not to investigate). The FBI's investigative work here is neither criminal nor national security. It is, Hosko explains, a background investigation led by the Security Division for a customer -- the White House. The results are packaged and provided to the customer. There is no local criminal investigation in this case, and the allegations so far do not fall under federal criminal statutes or national security areas. The FBI therefore puts the information in Kavanaugh's background check folder, which the FBI has already said it did. The White House must then decide if the FBI should investigate the matter further. A U.S. official tells CBS News that under the existing memorandum of understanding, the White House would need to ask the FBI to look into the allegations raised by Ford. Based on such a request from the White House, the bureau would then move forward. Former President George W. Bush said he and his wife, former first lady Laura Bush, stand by their support for Kavanaugh. Kavanaugh worked in the Bush White House as a top aide. "Laura and I have known and respected Brett Kavanaugh for decades, and we stand by our comments the night Judge Kavanaugh was nominated: 'He is a fine husband, father, and friend – and a man of the highest integrity. He will make a superb Justice of the Supreme Court of the United States,'" the Bushes said in a statement provided to CBS News and first reported by Politico. Mark Judge, the other person Ford said was also in the room during the alleged incident, told the committee through his lawyer that he doesn't wish to testify publicly. Judge denies any memory or knowledge of the alleged incident. "I have no more information to offer the committee and I do not wish to speak publicly regarding the incidents described in Dr. Ford's letter," Judge wrote to the committee. During a joint press conference with Poland's president, President Trump said he feels "terribly" for Judge Brett Kavanaugh and his family as he faces allegations of sexual misconduct. He called him an incredible individual with an "impeccable history in every way." Mr. Trump said that the allegations should have been brought to light a long time ago and that he "doesn't deserve this." 2:20 p.m.: Sen. Mazie Hirono to men: "Just shut up and step up"
"Guess who's perpetuating all these kinds of actions? It's the men in this country, and I just want to say to the men in this country, just shut up and step up. Do the right thing for a change. As you can see I'm a little upset by this, the fairness of it," an impassioned Hirono told reporters Tuesday on Capitol Hill. Hirono added that the White House was "victimizing" Ford for no reason. "Why should we participate in the victimization of someone who has the courage to come forward and she is under absolutely no obligation to participate in a smearing of her and her family." "There is no way to redo 1991, but there are ways to do better," wrote Anita Hill who testified before the very same Senate Judiciary Committee during Supreme Court Justice Clarence Thomas' confirmation process with her own allegations of sexual misconduct. In a New York Times op-ed, Hill recommended that committee "must demonstrate a clear understanding that sexual violence is a social reality to which elected representatives must respond." "Refrain from pitting the public interest in confronting sexual harassment against the need for a fair confirmation hearing"
Refer to Christine Blasey Ford by name and not simply "Judge Kavanaugh's accuser"
Demand Justice rolled out a new ad in the DC market attacking President Trump for his own misconduct allegations in the wake of Judge Brett Kavanaugh's. The ad references both the Access Hollywood tape and Mr. Trump's support for Alabama senate candidate Roy Moore. The group claims it plans to spend $700k. Amid detailed revelations of sexual misconduct, Kavanaugh's supporters have been making several arguments in his defense. Some are suspicious of the timing of the allegations coming just as the Senate aimed to wrap up Kavanaugh's confirmation process. Although Sen. Dianne Feinstein was aware of Ford's story in July, she did not attempt to delay the confirmation process until this month. 12:50 p.m.: Trump: "We want everybody to be able to speak up and speak out"
Speaking from the Oval Office in a meeting with Poland's president, Mr. Trump said that Judge Brett Kavanaugh is "anxious" to speak before the Senate. "I don't know about the other party, a delay is certainly acceptable we want to get to the bottom of everything," he said. "We want everybody to be able to speak up and speak out," he added, "We feel we want to go through a process, we want to hear both sides." Mr. Trump said that he felt the FBI shouldn't be involved in the process "because they don't want to be." He had confidence, however, in the Senate to do a "very good job" in the confirmation process. Ford and her laywer have not yet responded to requests to attend Monday's hearing according to an aide to Chairman Grassley. "Our staff reached out to Dr. Ford's lawyer with multiple emails yesterday to schedule a similar call and inform her of the upcoming hearing, where she will have the opportunity to share her story with the Committee. Her lawyer has not yet responded," the statement said. Grassley expanded on the non-committal from Ford in his interview with Hugh Hewitt. "It kind of raises the question do they want to, do they want to come to the public hearing or not? And the reason we're having the public hearing is obviously, well, number one is accusations like this deserve consideration and looking into, and that's what the purpose of the hearing is." He added, "Even before we requested him [Kavanaugh] to testify, he said he was willing to testify. As of Sunday night, I had that message. So we still haven't heard from Dr. Ford. So do they want to have the hearing or not? We're delaying the vote, strictly, to get all the facts out on the table." Grassley says he'd "hate" to have someone ask "what I did 35 years ago"
In an interview with conservative radio host Hugh Hewitt that aired on Tuesday, Chairman Grassley contended that he'd "hate" to have "somebody ask me what I did 35 years ago" in reference to Ford's upcoming testimony on Monday. He added, "I think I look at it this way. Accusers deserve to be heard. And after they're heard, we also have a responsibility to hear Judge Kavanaugh. And I want to hear from Dr. Ford. And she deserves to be heard, because these are serious accusations." 11 a.m.: Schumer calls hearing process "wrong, unfair"
Sen. Chuck Schumer on the Senate floor Tuesday called out Chairman Grassley for once again rushing through the confirmation process. He said Monday's hearing with Ford and Kavanaugh will not provide adequate time for senators who are not on the committee to review testimony before a scheduled vote the next day. He also questioned the lack of witnesses beyond Ford and Kavanaugh. "This morning, Chairman Grassley said that there would only be two witnesses. That's simply inadequate, unfair, wrong and a desire not to get at the whole truth and nothing but the truth," said Schumer. Schumer went on, comparing the nature of the Kavanaugh hearings to that of Anita Hill testifying before the Clarence Thomas confirmation hearings. "What a shame in this Senate," said Schumer. "Let's not repeat the mistakes made in the Anita Hill hearings. Let's call all the relevant witnesses, not just two selected by Chairman Grassley who did not want to call the hearings to begin with. Let's do this fair and full and right." In an interview with CBS This Morning, Helgi Walker, a partner at the law firm Gibson Dunn and friend of Kavanaugh's for over 25 years, called Kavanaugh a "great public servant." The two worked together in the White House counsel's office during the Bush administration. "He's so smart and so dedicated, a hard worker, courteous, kind. He's actually a very gentle souled person. And just a terrific friend," Walker said. She added that the allegations were a "complete shock" to her and cited the six FBI background checks into his record. "To my knowledge nothing like this has ever come up. And I think he has said this was a total surprise to him, he had no idea even who was making these allegations until she came forward and identified herself. So I think this was a bolt of out of the blue for him and also everybody who has known him for a good period of time like I have been lucky to know him." Walker, who clerked with Supreme Court Justice Clarence Thomas, noted the parallels to the controversies that blanketed much of the confirmation process for both judges. "I think it is unfortunately somewhat reminiscent of those hearings in the 1990's in that something as brought forward at the last minute and has created a situation that is so politically charged," said Walker. Speaking to "CBS This Morning", Sen. Kamala Harris said she believes Ford's story and commended her "courage" for stepping forward and being willing to testify before the Judiciary Committee. Sen. Kamala Harris says she believes Kavanaugh accuser: "She has nothing to gain"
Harris' comments come after the committee announced late Monday that both Kavanaugh and Ford will be scheduled to testify on Monday, delaying the committee's vote previously scheduled for Thursday. The White House issued yet another statement Monday on Kavanaugh late Monday afternoon. "Judge Kavanaugh looks forward to a hearing where he can clear his name of this false allegation," White House spokesman Raj Shah said. "He stands ready to testify tomorrow if the Senate is ready to hear him." Kavanaugh is speaking to staffers on the Senate Judiciary Committee about the allegation on a call at 5:30 p.m., a source familiar with the committee's process and schedule said. Democratic staffers, according to the source, have no plans to participate. Democrats on the Senate Judiciary Committee explained in a statement why they are not participating. "With only a few hours' notice and over the objections of Ranking Member Feinstein, Judiciary Committee Republicans scheduled a staff-level phone call with BrettKavanaugh concerning allegations that he sexually assaulted a young woman," the statement said. "In view of the enormity and seriousness of these allegations, a staff-only phone call behind closed doors is unacceptable and Democratic staff will not participate. This isn't how things should be done and is in complete violation of how this committee has worked in the past." "The FBI has the resources and know-how to conduct an objective, independent evaluation of these sensitive allegations with appropriately trained investigators. This isn't just about an interview, it's about analyzing information and gathering the facts. That's what the FBI does, and that's why they're in charge of the background review process. Taking to the Senate floor, Senate Majority Leader Mitch McConnell said the Democrats' handling of the Kavanaugh allegations was "really not fair." McConnell commended Chairman Grassley for following regular order in the process and urged to "pursue this by the book." Senate Minority Leader Chuck Schumer however argued that Grassley has to "stop playing games" with the process, saying that "hastily arranged private phone calls" are "not even close to constituting a fair and thorough review" and are not a substitute for an FBI background check or public hearing. He urged that the Senate "should and must provide a forum" for Ford to speak to her allegations. President Trump spoke up about Kavanaugh for the first time Monday afternoon in a meeting at the White House. Mr. Trump praised Kavanaugh's intellect and background, but also said he wants everyone in the process to be happy and is open to a slight delay. "He's an outstanding intellect. An outstanding judge. Respected by everybody," the president told reporters. "Never even had a little blemish on his record. The FBI has I think gone through a process six times with him over the years where he went to higher and higher positions. He is somebody very special. At the same time, we want to go through a process. We want to make sure everything is perfect, everything is just right." Organizers of the TIMES UP movement, which first became known during the wave of sexual assault allegations that rocked Hollywood, said in a statement, "If this moment in time feels strangely familiar, it's because it is. Listen to Christine Blasey Ford. A woman's experience should never be valued less than a man's career." Senate Judiciary Committee Chairman Chuck Grassley, R-Iowa, said in a statement that anyone who comes forward as Ford does should be heard — but stopped short of suggesting testifying before the full committee. Ford has expressed a willingness to speak before the committee, as has Kavanaugh. "Anyone who comes forward as Dr. Ford has deserves to be heard, so I will continue working on a way to hear her out in an appropriate,precedented and respectful manner," Grassley said. "The standard procedure for updates to any nominee's background investigation file is to conduct separate follow-up calls with relevant parties." "In this case, that would entail phone calls with at least Judge Kavanaugh and Dr. Ford," Grassley continued. "Consistent with that practice, I asked Senator Feinstein's office yesterday to join me in scheduling these follow-ups. Thus far, they have refused. But as a necessary step in evaluating these claims, I'll continue working to set them up." A spokeswoman for the Judicial Crisis Network, which has been working to help confirm Kavanaugh, confirmed the group will be announcing a $1.5 million cable and broadcast TV ad blitz to support Kavanaugh. It will feature a 35-year friend of Kavanaugh. "We are not going to allow a last-minute smear campaign destroy a good and decent man who has an unblemished personal record," the spokeswoman said. Sen. Susan Collins, one of the Republicans her own party has been working to ensure votes for Kavanaugh, tweeted that she wants both Ford and Kavanaugh to testify under oath in front of the Senate Judiciary Committee. "Professor Ford and Judge Kavanaugh should both testify under oath before the Judiciary Committee," she wrote. "Upon receipt of the information on the night of September 12, we included it as part of Judge Kavanaugh's background file, as per the standard process," the FBI repeated. Kavanaugh issued a new denial Monday morning in response to a woman's allegation that he assaulted her when they were both in high school. Kavanaugh said he's willing to "refute" her "false allegation" before the Senate Judiciary Committee "in any way the committee deems appropriate." Kavanaugh had issued a flat denial of claims outlined in a letter Ford sent to Democrats, but in his new statement, Kavanaugh said he had no idea who had made the accusation "until she identified herself yesterday." The White House is standing by Kavanaugh's initial denial. "This is a completely false allegation," Kavanaugh said in a statement Monday morning. "I have never done anything like what the accuser describes—to her or to anyone. Because this never happened, I had no idea who was making this accusation until she identified herself yesterday. I am willing to talk to the Senate Judiciary Committee in any way the committee deems appropriate to refute this false allegation, from 36 years ago, and defend my integrity." 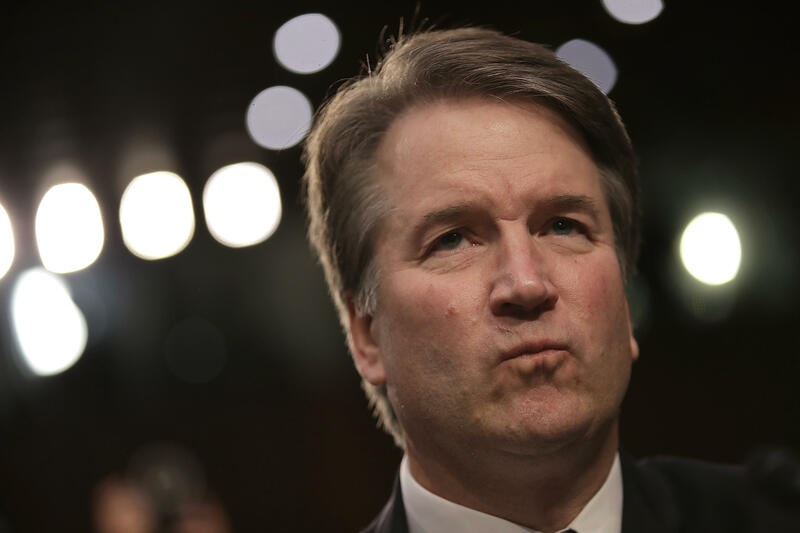 It's unclear whether the willingness to testify expressed from both Ford and Kavanaugh will delay the confirmation process. As of Sunday afternoon, Senate Judiciary Committee Chairman Chuck Grassley intended to move forward with the committee vote as planned. But some Republicans, not to mention Democrats, have expressed they want to hear from Ford first, and the Senate is out of session Wednesday for the Jewish holiday Yom Kippur.